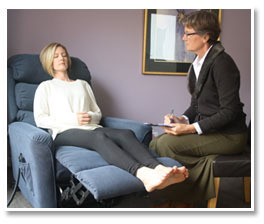 Most people have experienced a type of self-hypnosis or trance in their daily lives. If you have ever driven to a location and then realized that you have no memory of the trip, you have experienced the trance state. If you have ever tried to get the attention of someone engrossed in the television, knowing that they are not really with you, you are witnessing a type of hypnotic trance. It’s a common state. The easiest way to describe how it feels is simple: deeply relaxed. Repetitive thoughts and ideas are stored in the subconscious mind as truths and form the core beliefs about who we are and how we behave in the world. Sometimes these beliefs and thoughts are negative and invalid but, if left unchecked, they can control our lives. Hypnosis accesses the subconscious mind and provides an opportunity to identify negative beliefs, challenge them, and replace them with healthier, more life-sustaining ones. You remain in full control during hypnosis and can stop at any time if you wish. Pam’s role is to help you access your subconscious to change disempowering thoughts and ideas that are limiting you in some way; for example, you may have identified the following belief: “I want to stop smoking but I can’t, because it helps me relax”. Pam uses Hypnosis in conjunction with Psychotherapy and Counselling, to assist you to make changes in all facets of your life. Pam does not have any power over you with Hypnosis; she is helping you tap into your own power. She cannot make you do anything against your own will. There is an important distinction here. Some clients assume that Pam is “magically curing them” or that she is responsible for changing them, whereas she is actually responsible for assisting them in finding their own inner power. She will assist you to access your subconscious mind and reprogram limiting or false beliefs with positive life-affirming beliefs that you will create personally. The responsibility for change is with you; Pam is here to assist you to facilitate that change. What are your current limiting beliefs? What do you ache to do if only you had the courage, money, opportunity, time, support or energy? Do you desire a career change, new love, a geographical shift, or better relationships with other people? Your life is how you chose to see it. You experience what you believe; you experience what you expect. “I knew that would happen!” Yes. If you put that much mental energy into a belief, good or bad, you can create it. The subconscious is THAT powerful. Make the positive change. DO IT. That will be magic! This will vary depending on the type of change that you are seeking. Initially we will discuss the changes that you wish to make, the limitations that this current behaviour is having on your life and the reasons that you wish to make the changes. Then we will discuss the benefits of making the changes. Pam will use your input to feed back to you during the trance state. You can elect to lie down or sit upright, whichever is most comfortable for you. Pam will take you into a relaxation exercise to promote the trance state, and may or may not ask you questions; each person is different.